Making a digital camera that shoots only in black and white might seem like a stroke of madness to most people, but German prestige camera brand Leica seems to think it is such a good idea it has introduced an updated version of its existing Monochrom rangefinder. The new model is called the M Monochrom (Type 246) and brings with it a collection of dramatic improvements over the first model. Since that original Monochrom was launched in 2012, Leica has made some significant changes to its M series of digital rangefinders, including improved sensors, better screens and a slightly redesigned body, and this new Monochrom (Type 246) gets all of those developments and more. The most easily digested upgrade here is the move from an 18-million-pixel CCD sensor to a 24-million-pixel CMOS unit. Not only does this give us more resolution, but the use of CMOS technology means the Monochrom (Type 246) gets live view display and the ability to shoot 24fps Full HD video too. The camera’s rear screen is new as well – the 3-inch 921,600-dot LCD covered with a protective sheet of super-hard and scratch-resistant sapphire glass is a great improvement over the previous 2.5in 230,000-dot model. Other new features on the Typ 246 include a faster processor that can push DNG raw files and JPEGs to the memory card a lot quicker than before, as well as being able to display captured images with less delay. As a camera the shoots only in monochrome the Monochrom has no need for the colored filters that usually cover pixels on digital sensors. Without these filters more light reaches the photodiodes, so the lowest sensitivity setting is ISO 320 – with the range extending to ISO 25,000. As with most other modern Leica M cameras, users have a choice of manual exposure or aperture priority, and focus is, of course, an entirely manual affair. Shutter speeds run from 60 seconds to 1/4000sec, and the shortest shutter time that can be used with flash is 1/180sec. In the sense that the Monochrom uses no interpolation, no low pass filter and only shoots in black and white, it is completely alone in the market, and faces no direct competition at all. Almost every digital camera has a black and white mode, and all digital images can be converted to black and white in software, but none will be quite the same as this. As much as Leica M cameras are designed to be portable and discrete, the M Monochrom (Type 246) is a pretty hefty and solid camera. Its whole top deck above the area covered in leather is milled from a single solid lump of brass, as is the base plate. The rest of the body is made from magnesium alloy, and while that is a lightweight metal its gravity-defying properties do little to offset the mass top and bottom. The camera does immediately feel extremely nice, and as though its handmade body and dials will never wear out. The M cameras have a minimalist design that for the Monochrom includes only 11 buttons across the whole surface – including the shutter release. The only dial is an analogue-style shutter speed dial, and there are only six access buttons beside the LCD. The rear controls are quite different from the previous Monochrom with a four-way rocker around the Info button and a new rear thumb wheel to drive speedy navigation through menus and to magnify images in review mode. Also new for this incarnation of the black and white M is a front-mounted exposure compensation button. Although finding, pressing and then using the rear thumb wheel while the button is held in isn’t quite as easy as I’d like it to be, the set-up is a good deal more convenient than the previous arrangement. Alternatively there is an option in the ‘Set’ menu to set exposure compensation via the rear dial, which is more convenient still. Being quite heavy and smooth, the camera isn’t especially easy to hold unless you grip it in the shooting position. You might find this uncomfortable at first, but will be rewarded with the fact that your finger positions will mean you are always ready to shoot. With your hands in the shooting position you’ll find all the controls you need fall just where you would expect them to be. The aperture ring of Leica lenses sits near the end of the barrel where the thumb and index finger can take control, while the focusing knob sits closer to the body where the middle finger can slide it back and forth to bring the rangefinder into alignment. The bright viewfinder provides a double-image rangefinder with guidelines for the lens in use – so you can compose and focus at the same time. Six focal lengths are represented by the frame guides, and are shown in pairs: 35mm and 135mm, 28mm and 90mm, 50mm and 75mm. Other focal lengths can be used on the camera, but composition will need to be carried out via the live view screen – which shows a 100% view of what will be captured by the sensor. I have suddenly got to a stage where I need to wear glasses when looking through a camera – but still found the view clear, full and simple to understand. There isn’t too much information in the viewfinder, so you have to keep track of the position of the aperture ring. In aperture priority mode you are kept informed of the shutter speed in use, but in manual mode you just get told you are under or over exposing – though not by how much. The menu system is really pretty straightforward. Leica doesn’t pile on the options, features and modes, and while there are plenty of menu streams they are layout simply and in a way that everything can be found very quickly. As you would expect, the menu items are in black and white too – but light up red when selected. Shooting in raw and JPEG mode simultaneously can create some delays while the camera processes the images, but conversely makes image review scrolling quicker. With the uncompressed DNG files being compatible with just about every raw image software package, there isn’t too much need to record JPEGs – unless you want to use the in-camera colour toning – so most people will shoot DNG-only and bypass the extended processing. Despite the lovely build and feel of the camera it is its image quality that makes it stand out. Pictures are really full of detail to a degree that we wouldn’t expect from a normal 24MP sensor. Edges are smooth when viewed at 100%, and the artefacts of interpolation and compression don’t make an appearance. JPEG files are just as well populated with texture and fine, uninterrupted detail as the raw DNG files are, and confusing or overlapping patterns never turn into a mush of moiré and interference. The benefits of each pixel reading out its own value, instead of cluster readings averaged across four (which is how regular color sensors work), makes a very big difference to the final result – as we would expect it to. I compared a collection of images taken on the Monochrom with files recorded with the Nikon D610 in both its colour and black and white modes. While the D610 has a wider dynamic range and is much more capable of retaining highlight details with minimal effort on the part of the user, it is not as able to record fine detail as clearly as the Monochrom. The Leica files process a definition and clarity – a ‘clean-ness’ – that normal Bayer-pattern sensors cannot match. The greatest difference between raw and JPEG files from this camera is that the JPEGs are less forgiving of the limited dynamic range of the sensor. Highlights burn out quite quickly, a fact not helped by some over-bright metering, and I found I was working between -0.3EV and -1EV compensation as standard. Unsurprisingly, JPEG files return with a good deal more punch in the middle tones than the raw files do, and they look good and ready to print for it. Raw files need a proper boost to get them going and looking three dimensional – but the great thing is they can cope with it. I found the tones are really pretty flexible in the centre of the range, and stretching and compressing can be done without hard transitions appearing. There is a lovely soft quality to unworked images that suits some subjects much better than others, but which works especially nicely for low contrast portraiture. Obviously, as much contrast as you like can be injected afterwards for a whole range of looks. Noise isn’t much of an issue either, as what exists isn’t anywhere near as destructive as normal image noise. At ISO settings up to and including ISO 1600 noise is hardly noticeable. When it appears at higher settings it is as a fine grain that is atmospheric rather than objectionable. A definite benefit of the filter-less, non-interpolating sensor is that noise doesn’t destroy detail, and even the noise-reduction that takes place in JPEG files leaves behind fine textures and detail. Images shot at ISO 320 and 400 are just extremely smooth and capable of recording the finest detail. There is a faint base texture, but the overall appearance is of a very clean image. 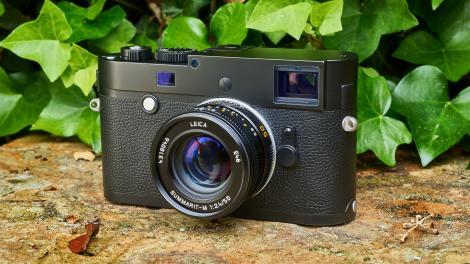 Leica M240: This is the ‘color’ version of the Leica M and we chose this to see a direct comparison of how the sensor change affected the performance. Sony A7R: This would be a tough comparison for the Monochrom’s resolution, since the 36-megapixel A7R has 50% more pixels. Nikon D610: Like the Monochrom, the D610 has a 24-megapixel full-frame sensor, and it’s a lot cheaper. We’ve carried out lab tests on the Leica M Monochrom (Typ 246) across its full ISO range for resolution, noise (including signal to noise ratio) and dynamic range. We test the JPEGs shot by the camera, but we also check the performance with raw files. Most enthusiasts and pros prefer to shoot raw, and the results can often be quite different. It’s worth pointing out that the lab tests for the Leica M240, Sony A7R and Nikon D610 were carried out in color, which is what these cameras are designed for. To see the subtler differences in the Monochrom’s black and white rendition, see the Nikon D610 comparison images in the Performance section. We test camera resolution using an industry-standard ISO test chart that allows precise visual comparisons. This gives us numerical values for resolution in line widths/picture height, and you can see how the Monochrom compares with its rivals in the charts below. JPEG resolution analysis: The Sony A7R leads the field for JPEG resolution, its 36-megapixel sensor delivering more detail than the 24-megapixel sensors in the other models. Of the rest, the Monochrom matches or beats the Nikon D610, depending on the ISO setting, and is clearly sharper than the regular (color) Leica M240. Raw (converted to TIFF) resolution analysis: The results from the raw files are much closer, where the Monochrom is right at the top of this group for resolution. This is the chart we use for testing camera resolution. The key area is just to the right of centre, where a series of converging lines indicates the point at which the camera can no longer resolve them individually. We shoot this chart at all of the camera’s ISO settings, and here are two samples at ISO 320 (the Monochrom’s base ISO) and ISO 6400. ISO 320: Click here for a full size version. Dynamic range is a measure of the range of tones the sensor can capture. Cameras with low dynamic range will often show ‘blown’ highlights or blocked-in shadows. This test is carried out in controlled conditions using DxO hardware and analysis tools. Dynamic range is measured in exposure values (EV). The higher the number the wider the range of brightness levels the camera can capture. This falls off with increasing ISO settings because the camera is having to amplify a weaker signal. Raw files capture a higher dynamic range because the image data is unprocessed. JPEG dynamic range analysis: The Monochrom’s limited JPEG dynamic range is very obvious in this comparison, a property it shares with the Leica M240. The Nikon D610 and Sony A7R can capture a wider brightness range without clipping shadow or highlight detail. Raw (converted to TIFF) dynamic range analysis: The Monochrom’s raw files contain a much wider dynamic range than its JPEGs, but it’s still near the bottom of the group, especially at higher ISO settings. This is a test of the camera’s noise levels. The higher the signal to noise ratio, the greater the difference in strength between the real image data and random background noise, so the ‘cleaner’ the image will look. The higher the signal to noise ratio, the better. JPEG signal to noise ratio analysis: The Monochrom’s signal to noise ratio is not especially good compared to its rivals, which means you will see a little more noise in its JPEG images. However, the kind of noise it produces is more pleasing and ‘natural-looking’. Raw (converted to TIFF) signal to noise ratio analysis: The noise levels in the raw files are much closer, and although the Nikon D61o is visibly better in the low and high ISO ranges, the Monochrom, Sony A7R and Leica M240 are very close. The signal to noise ratio charts use laboratory test equipment, but we also shoot a real-world scene to get a visual indication of the camera’s noise levels across the ISO range. The right side of the scene is darkened deliberately because this makes noise more obvious. ISO 320: Click here for a full-size version. In 2015 we really are not short of cameras, and in truth many of the cameras we see do much the same thing. The Leica Monochrom (Type 246) stands out not just because it offers something different, but also because the difference it offers is worthwhile and well done. There is no doubt it is an expensive beast, but if your thing is shooting in black and white and you want the best quality you can achieve with a really pleasing, authentic shooting experience, then the Leica M-Monochrom (Type 246) may well be for you. There are some things that could be done better, such as the level of viewfinder information and the exposure compensation button, and in an ideal world I’d really like more dynamic range and ISO 100, but even with these shortcomings there isn’t too much to touch what this camera can do – and there is certainly no direct competition. The Leica M-Monochrom (Type 246) is an exceptional camera in so many ways, from the way it’s designed, the way it works and the way its images look. Owning one means a life of manual focusing and getting used to using a rangefinder – which just takes time to learn – and a lack of many of the other modern conveniences we have become used to. It also means though that your images will be sharper, more detailed and cleaner at all ISO settings, and for that there are plenty of people prepared to pay the asking price. Is this a better solution than shooting colour with a DSLR and converting to monochrome? Yes, if image quality is your number one priority. No, if convenience is. The look, feel and design of the camera, but mostly the outstanding image quality it produces. The uncompressed raw files are like nothing else, they work easily and they are stuffed to the gills with information. Coupled with Leica’s first class M lenses, the Monochrom (Typ 246) is a route to clean, correct and distortion-free picture taking. The updates to the screen, the sensor, the frame guides and the processor have all made this a significantly better camera than the previous model. The worst thing for most people about the Monochrom (Typ 246) will be the price. The kit I want, a body and three lenses, costs £12,750 which is a serious pile of money when compared to what it would get you from other brands. The other things I’d like to see changed or improved are the ISO range, the dynamic range, the metering and the exposure compensation access. A very fine specialist camera which comes at a price that reflects the quality of its build and engineering as much as it does its picture quality. Those brought up on autofocus DSLRs will find it difficult to get used to, with its rangefinder focusing and limited list of features, but we could all quickly get used to the image quality. You have to be a pretty committed black and white shooter to consider the Monochrom (Typ 246) and it really isn’t for everyone, but if great monochromatic images are your aim and money not enough of an object this is the camera for you.